Archdiocese of Wellington Young Catholic Leaders at camp. 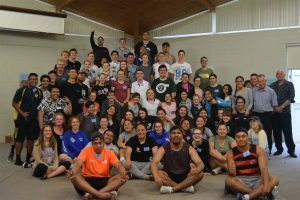 Young Catholic Leader (YCL) is a five-day Catholic leadership course run in December each year in Wellington, Palmerston North and Hamilton dioceses. A limited number of year 12 student leaders are invited, mainly from Catholic colleges but also from parishes and chaplaincies. It prepares students for leadership roles in their final college year. After ten years and nearly a thousand graduates, the course is a winner for schools, parishes and for the young leaders. Students from Palmerston North Diocese colleges. Cardinal John Dew wrote us a letter about the importance of living our faith. He came and answered our numerous questions, before celebrating Mass with us. A highlight was Reconciliation, which I’d never experienced. The Sacrament and prayer environment were amazing.